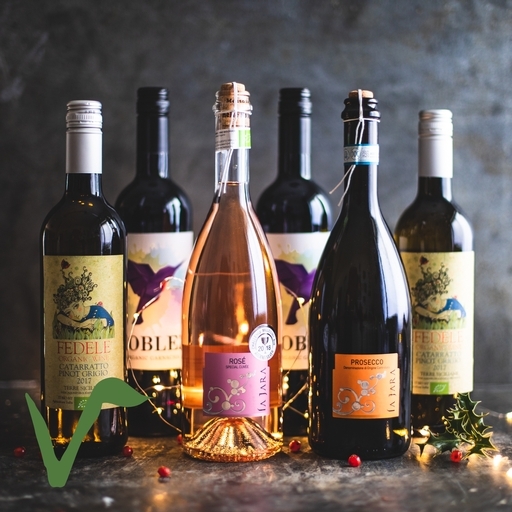 A great value mix of crowd-pleasing organic wines, specially selected for Christmas parties. There’s one bottle of our favourite pink party fizz La Jara Rosato Frizzante, plus one bottle of La Jara Prosecco, two bottles of extremely drinkable Garnacha Doblez, and two bottles of fresh and fruity Fedele Catarratto Pinot Grigio. La jara rosato frizzante 75cl: Glera & Raboso, Alcohol 10%, sulphites 100mg/l, produced in Italy, Suitable for vegans. 2 Fedele catarratto pinot grigio 75cl: 60% Catarratto & 40% Pinot Grigio, Alcohol 13%, sulphites 92mg/l, produced in Italy, Suitable for vegans. 2 Garnacha Doblez 75cl: 100% Garnacha, Alcohol 13.5%, sulphites 82mg/l, produced in Spain, Suitable for vegans. All our organic wine is meticulously sourced by Ben Watson from small-scale producers.